The plan Metra is presenting would bring trains to Hyde Park roughly every twenty minutes at midday, while reducing service to the South Chicago and Blue Island branches. While Metra has presented this plan within context of current service, understanding what the Metra Electric District is capable of providing to Chicago requires looking deeper into its history. Metra Electric is nearly unique among American “commuter rail” operations in that it did, historically, offer rapid-transit-quality service to the South Side—this changed most rapidly after the Regional Transportation Authority (RTA), with its chronic funding problems, took over. Service in the middle of the twentieth century ran at frequencies unimaginable today—and beyond what Metra is offering in its new plan. In recent years, advocates and coalitions have periodically proposed fixes for the Electric Division’s increasing woes, suggesting utilizing its existing infrastructure to provide quality service to the underserved neighborhoods of the South Side. Metra’s plan does not accomplish that goal. As Steven Vance’s analysis in Streetsblog Chicago points out, the current plan would enhance service to Hyde Park—but at the expense of cutting it to neighborhoods with higher levels of poverty, disinvestment, and disadvantage, such as South Chicago, West Pullman, and Morgan Park. (After a series of public meetings, in which South Siders raised concerns about this tradeoff, the Metra said it would make some adjustments to the schedule and release it in the fall for community input, DNAinfo reported). This plan is sadly no accident, but rather a product of a fundamental mismatch between an infrastructure asset and the organization tasked with running it. Metra’s paradigm for running a railroad simply is not suited to the Electric. Comparing American and international models for operating suburban rail networks makes the differences clear: other countries treat every rail line as an opportunity to provide frequent service, all day long, on the model of full-scale urban transit such as the “L.” Meanwhile, as I argued in my master’s paper for the State University of New York at Albany’s Regional Planning Program, the “commuter” rail—a concept that exists in this form only in the U.S.—is a niche product that works well only for those making a simple suburb-to-downtown commute, emphasizing fast trains that make limited stops and have long distances between stations. The Electric District’s infrastructure is clearly more suited to the former style of service than the latter. Stop spacing is extremely short, around half a mile in most places within Chicago proper. The line sports high-level platforms and electrification, rapid-transit-quality features that few commuter rail lines in the U.S. boast. The same suitability for frequent, all-day, transit-quality service exists in the Electric District’s ridership base. People living in lower-income South Side neighborhoods are less likely to hold white-collar nine-to-five jobs in the Loop, and more likely to need transit for non-commute daily tasks, given lower rates of car ownership and a greater percentage of children and seniors in the population. Historically—before Metra’s stewardship, which began with an RTA funding agreement in 1976—the Electric District (then known as the Illinois Central) served these needs fairly well. Today, within the misapplied commuter rail paradigm, it cannot. No wonder Metra Electric ridership has been in freefall for decades. Metra’s fundamentally mismatched vision of the Electric District is guaranteed to produce a “death spiral” (as Streetsblog’s Angie Schmitt called it), as indeed it has over the last thirty-five to forty years. Metra’s new plan represents not a genre-busting effort to restore bygone glory, but a modest attempt to fit the square peg of transit-quality service into the round hole of the “commuter” rail paradigm. It comes off as transit planning for the sake of business and college travelers—like Mayor Emanuel’s silly airport express, luxury transit for relatively well-to-do white folks, while transit- and resource-poor South Side neighborhoods continue to wait their turn. Is this how transit planning in Chicago should be done? Still, Metra’s recognition that the Electric District needs a re-thinking presents an opportunity to bust the commuter rail paradigm entirely and return the entire railroad to its roots as a key part of transit on the South Side. Instead of a limited improvement targeted at the line’s most privileged users, transit planners should aim higher—toward a restoration of the kind of frequent service that the Electric once brought to much of the South Side. While the concept of regional rail—that is, non-subway, -elevated or -light rail that provides frequent service with short distances between stops, effectively acting as rapid transit—is very common internationally, it is beginning to catch on in North America as well. Denver’s Regional Transportation District is in the process of opening a network of regional rail lines providing service at high frequency (in most places, fifteen-minute intervals all day long, every day). Caltrain, which connects San Francisco, Silicon Valley, and San Jose, is in the process of electrifying its railroad and providing service as frequently as every ten minutes, all day long. Toronto and the Province of Ontario have launched a major effort to turn the GO Transit commuter rail network into a Regional Express Rail system providing frequent, electrified trains. And Chicago has advantages that none of those systems can boast: existing assets such as a high-capacity four-track right of way, electrification, high platforms that allow for level boarding, and new (though not modernly-designed, and poorly suited to rapid transit service) trains. The infrastructure is essentially in place; all that is lacking is the political will to fund the level of service that once existed, and for which demand exists. If Metra is willing to crack open the door to doing things differently, advocates, South Side stakeholders, and elected officials should insist on throwing it wide open. Returning frequent Electric service to the South Side is, at a basic level, a trivial infrastructural task—but no small lift politically. To be fiscally sustainable while operating at frequencies akin to those of the “L,” regional rail trains must run with a crew that looks more like that of the “L.” Indeed, it was a dispute over crew sizes that contributed to ultimately pushing the Electric District’s former private-sector operations into the red back in the 1960s, leading to the line’s prolonged death spiral and transition to public-sector ownership. The CTA has come to see any transit operation within the city of Chicago as its turf; whether or not it formally takes ownership of the Electric District, as some advocate plans have proposed, the turf wars between it and Metra will have to be worked out to the advantage of the public interest. That turf war sent fares on the then-Illinois Central skyrocketing, leading to their wide divergence from CTA fares today; the systems would have to be rationalized and made to work together. On the South Chicago branch, more frequent trains means more frequent gate closures at the numerous street crossings. As numerous international (and the growing number of North American) implementations prove, these are perfectly surmountable barriers; but they require sustained, good-faith effort, and most likely sacrifice on behalf of some partners. Rather than building its way out of jurisdictional conflict, Chicago has the chance to lead the U.S. in focusing on organizing its transit policy first—an approach often known as “Organization Before Electronics Before Concrete” that guides transportation policy in some of the countries with the world’s best transit, such as Switzerland and Germany. Still, expansion of Metra Electric service has political advantages as well. As Caltrain’s struggle to secure its electrification grant demonstrates, the presence of a federal funding partner for transit projects is far from guaranteed in the age of Trump. Since most transit infrastructure expansion projects rely in part on federal funding, this threatens Chicago’s ability to expand and improve the CTA network—and, in particular, places its ability to complete the showcase South Side project, the Red Line Extension to Roseland, in doubt. In crisis, though, comes opportunity; the withdrawal of a potential federal partner places a significant value premium on transit improvements that can be made without significant capital expenditure. 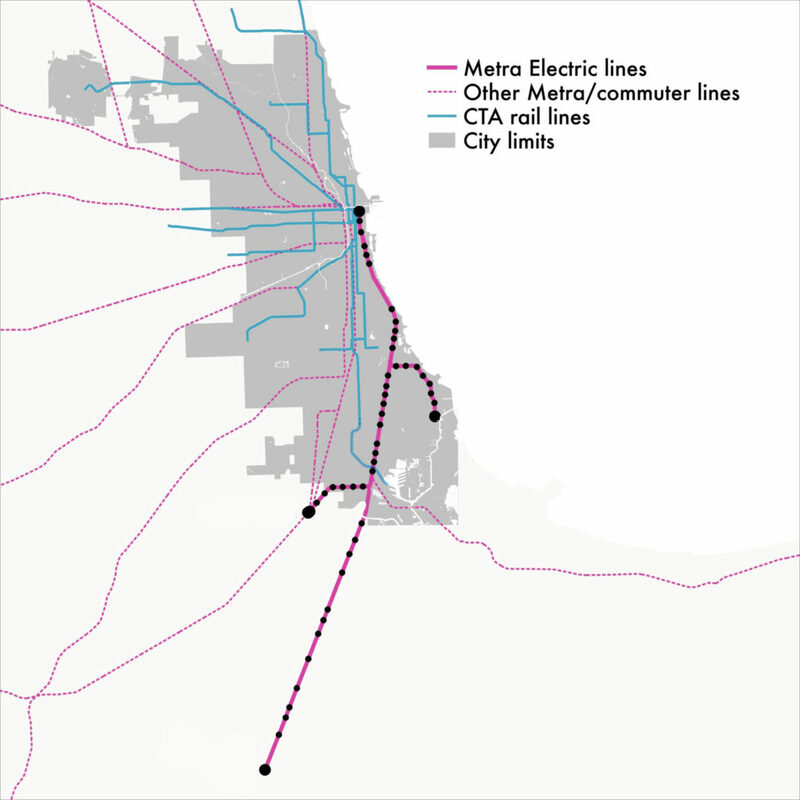 Luckily for Chicago, the Electric District already serves the neighborhoods to which the Red Line Extension would bring service; more frequent service, especially off-peak, could be initiated in the very short term. Expansion of Metra Electric service to Roseland, Pullman, and the neighboring areas would also provide an opportunity to correct the damage done to the area’s internal transit grid with the opening of the Dan Ryan Line in 1969. In other words, the Metra Electric holds the promise of bringing better access to jobs, resources, and education to one of the neediest parts of the South Side, and now—not some murky number of years down the line, and not dependent on the vagaries of the federal government. The existence of the Metra Electric’s high-quality infrastructure and legacy of frequent service is, in some ways, a silver bullet ideally designed to mitigate the impact of uncertain federal funding while meeting significant and growing local needs—but only if handled correctly. That means restoration of high levels of service everywhere, not just for those who demand it most loudly or have the most political chips to cash in. All of this can be done with local resources and at relatively little expense, if bureaucratic and political obstacles stop getting in the way. Chicago can start to move forward on transit in real ways if—and only if—it is willing to confront the mismatch between the Metra’s infrastructure and its purpose, and emphasize quality service to the public over bureaucratic and political convenience. The door is being cracked; it’s time to pry it wide open. Sandy Johnston is a former Chicagoan and a transportation planner with the Boston Region Metropolitan Planning Organization. He holds a Master’s of Regional Planning and a Certificate in Urban Policy from SUNY Albany. Sandy blogs at itineranturbanist.wordpress.com and tweets (voraciously) @sandypsj. Interesting insights. You are correct that Metra’s focus on traditional commuting patterns seems to short change reverse and other non-traditional commuting market opportunities. It is indeed ironic that other diesel powered lines, the BN Aurora Line in particular, have much more robust service, when that kind of service is usually deemed one of the advantages of electrification. It is indeed unfortunate that the plan to buttress Hyde Park service gives off the appearance of gentrification. Cause or effect, its hard to say. But nevertheless it heartens this old transit advocate who remembers the IC electric service in the early sixties to know that thoughtful people like you are thinking this hard about this issue. The few of us of the Transit Riders’ Authority believe a CTA purchase of Metra Electric service would resolve the problem with little capital expense. Existing rushhour trains would provide ample equipment, at least initially, to run more frequent off-peak service to South Chicago, the mainline to Kensington where transfers can be made to University Park trains, and Blue Island where transfers can be made to the Rock Island to Joliet. Rather than going through a turnstile, a Ventra card would be used for a proof of payment card on Metra and registered for transfers to CTA and Pace trains and buses. This system would be compatible with Metra and South Shore zone fare tickets and smart phone apps for trips into the suburbs, something the Red Line extension does not facilitate. The line was not “known as the Illinois Central,” it was the IC. IC had a history from the mid-1960s onward of disinterest and deferred maintenance on all three IC lines, but the South Chicago branch in particular. All lines converted to electronic ticketing similar to subways as IC worried more about scoff laws and less about service. Even the L truncation from Stony Island had little impact on IC ridership. As a Hyde Park resident, I could see how the IC grew increasingly intolerant of its suburban services even as the RTA continued to build the mainline farther south. The one wildcard is that the forthcoming Obama Presidential Library will stretch between 61st-63rd Street immediately east of the elevated ROW. Metra has a golden opportunity to be THE route to the OPL with service farather south than 55-56-57th streets. The South Chicago branch is capable of being part of this development, although the SCB is not the high-speed grade-separated ROW the mainline is. And Metra has another opportunity with the long term development of the former US Steel South Works. IC’s brilliance in raising the ROW in the early 20th century left it the only line into downtown without a single road or rail crossing for the last 28 miles. The east side of the ROW needs to be preserved for high-speed rail along with the ex-NYC ROW east from Grand Crossing with the IC (now CN). A study of work and commuter patterns needs to be completed to insure the need for additional SCB off-peak service and Metra needs to revisit competitive ticket pricing strategies. This article fails to mention that service on the mainline between 63rd st. and Kensington (115th st.) will also be increased. That segment goes through some lower income communities.